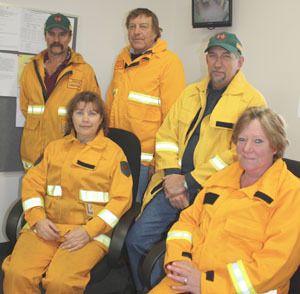 “We class ourselves as a rural firefighting brigade, but it really is a team effort involving local farm units and the whole town who rally around whenever we have a big fire,” Curramulka CFS brigade captain, Neville Watters, said. The Curramulka district has had its fair share of major incidents, with two big fires threatening to engulf the town in the past five years. Brigade morale has been given a huge boost with the official opening of the new station in April, a record turnout to the annual general meeting last week, and five young people putting up their hands to start cadet training. The new station, with its separate truck bay and communications/meeting room, is almost overwhelming, Mr Watters said. Curramulka Country Fire Service volunteers Steve Parsons, Ray Phillips, captain Neville Watters, Anne Boyle and Lee Phillips agree the new station has given the brigade and the whole community a huge morale boost.